The majestic triple-arched portal at the point where 12th Street meets Zapata Avenue signals the principal entrance to Havana’s Colón Cemetery. This Romanesque-inspired portico, 34 meters long by 21.66 meters high, is crowned by a monumental Carrara marble sculpture group representing the Christian virtues of Faith, Hope and Charity and was created by Cuban artist José Vilalta de Saavedra. The cemetery has been an important landmark in the city ever since its construction concluded in 1886 and today, besides its obvious function, it is a destination on tourist maps, rivaled only by Père La Chaise Cemetery in Paris. The necropolis’ first claim to fame is that it is the only one to have been named after Christopher Columbus. It was designed by Spanish architect Calixto Aureliano de Loira y Cardos who directed the construction which took about fifteen years to complete. Ironically Loira died at a young age and was buried in one of the recently opened underground galleries. The growing capital city was in need of larger burial grounds and after its inauguration expansion processes ending in 1934 brought it to its present dimensions. 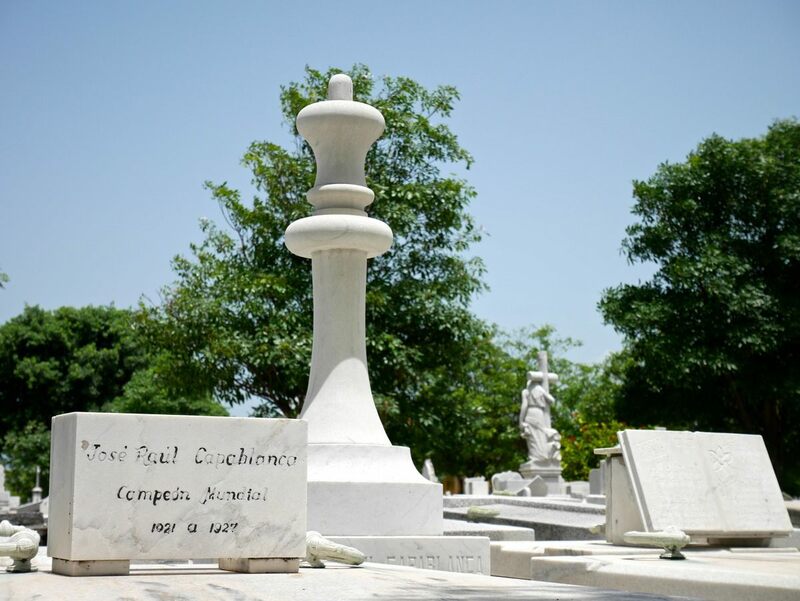 Indeed, the Colón is no ordinary cemetery. Covering a rectangle of 57 hectares, with an octagonal neo-Romanesque chapel in the center, it is by no means a somber or austere place. As you walk through the grid of tree-lined avenues you are immediately struck by the sumptuous architecture, with its profusion of styles, and the artistic funerary sculpture all around you: it has been referred to as an enormous marble quarry because of the amount of marble deposited there. All possible artistic styles, with an emphasis on figurative art, create a veritable al fresco museum. If you have the time and the patience, you can read some of the inscriptions and begin to get a sense of the cultural and historical value of this location. 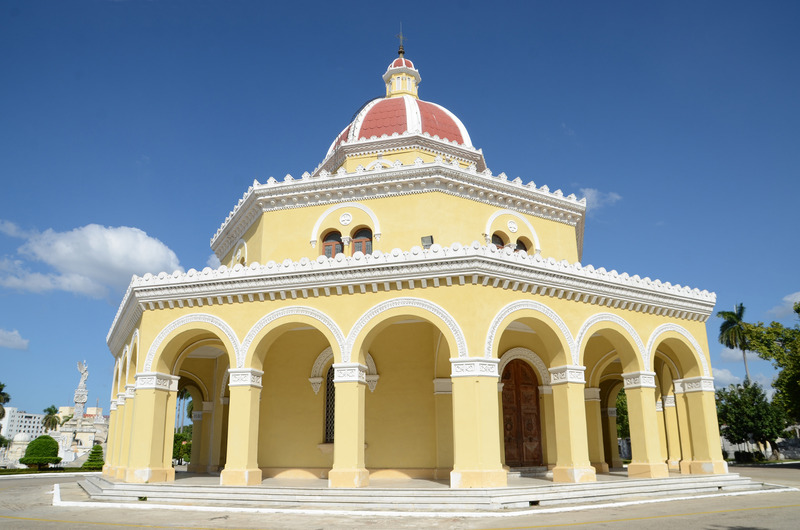 It is like taking a walk through the pages of Cuban history. No matter how you choose to enter, you will be surrounded by an impressive gallery of personages, each with some interesting story to tell about the past. Artists, politicians, heroes, the clergy…they are all together for eternity. It is the resting place of figures like the Generalin-Chief of the Cuban Army during the War of Independence against Spain Máximo Gómez Báez, chess champion José Raúl Capablanca, musician Amadeo Roldán, eminent scientist Dr. Carlos J. Finlay and writers José Lezama Lima, Cirilo Villaverde and Alejo Carpentier, just to name a few. In particular, some tombs and monuments have accumulated their share of picturesque and often surprising stories. For example, the so-called Domino Tomb holds the mortal remains of a woman who loved to play dominoes and died in the middle of one losing match, victim of a heart attack. Her fellow players collected money to pay her tribute and so today, over her tomb, there is a marble “double-three” commemorating that intense last game. Another sculptural masterpiece, one that is based on more tragic events, is the Firefighters’ Mausoleum, which was erected by the City in 1897 to pay homage to the brave men who perished because of the negligence and egoism of the owner of a hardware store who set fire to his business in order to collect the insurance. Unfortunately, the man had explosive material stored in the back and there were two explosions which reduced the building to rubble. Thirty-eight people, 25 of whom were firemen, perished in the fire. The monument shows four very large figures that symbolize Abnegation, Pain, Courage and Martyrdom. 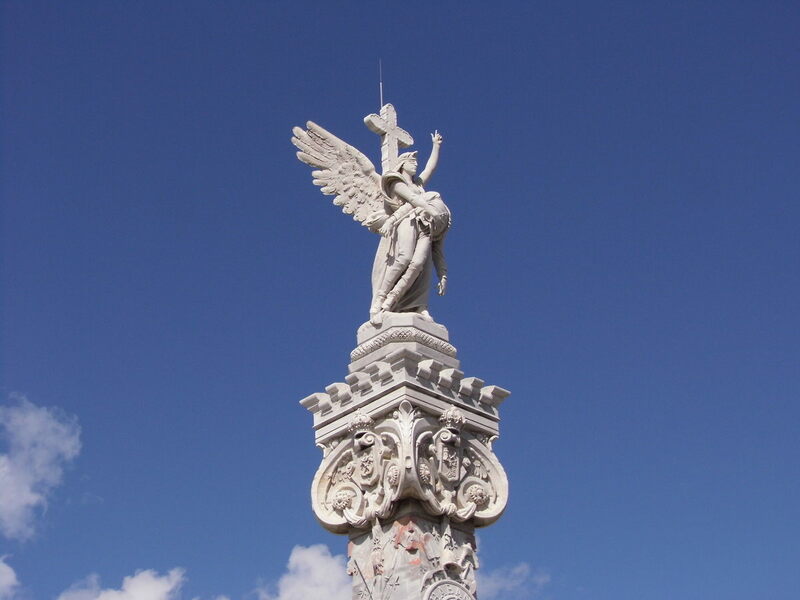 The central column is crowned by a sculpture that represented the Angel of Faith leading a fireman to immortality. The Tomb of the Dog enshrines the story of a woman who was very attached to her dog. When the woman died, the dog would visit her every afternoon, lying at the foot of the tomb. One day the dog died there and the woman’s relatives had an image of the dog sculpted and placed just where he would lie in life. The engraved message says: Faithful even after death. 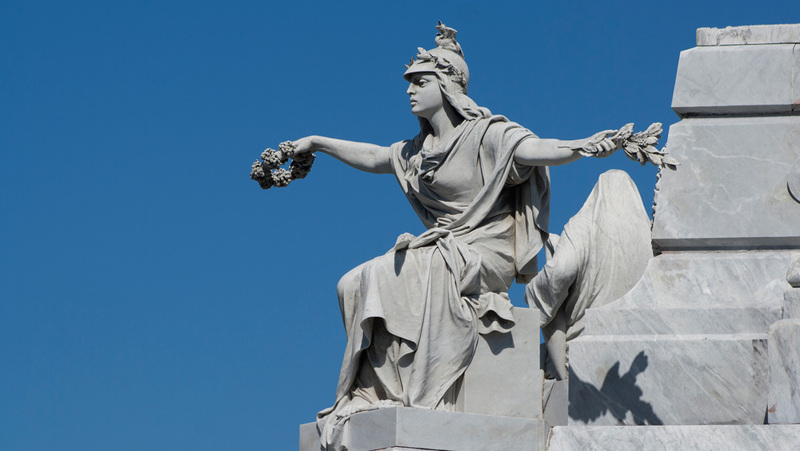 A visit to the Christopher Columbus Cemetery of Havana is far from being a sad or gruesome visit. It is well worth it to spend an hour or two learning more about a fascinating city and its people.